We’re proud to announce that Murmur Creative has won the 2015 prize for Best Rebrand by the American Marketing Association’s MAX Awards. 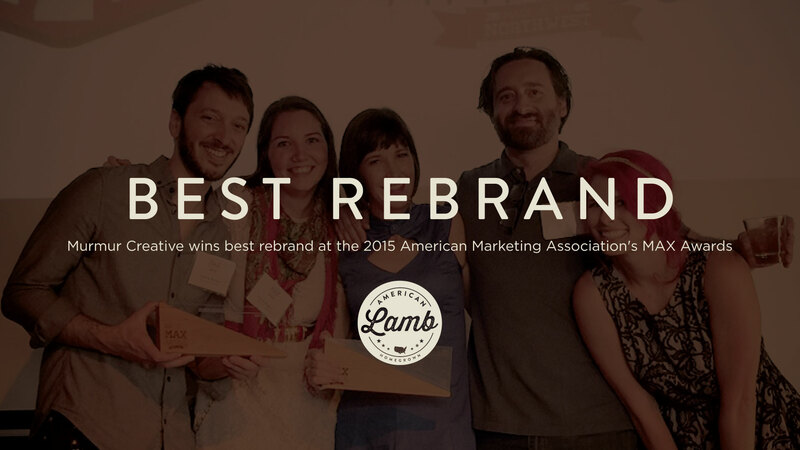 We won for our rebrand of the American Lamb Board, a project which included logo design, print materials, a new website, infographics, SEO strategy, and more. This category was the most competitive at the MAX Awards and we were up against some incredibly talented Portland design agencies. The American Lamb Board is an industry-funded board that represents all sectors of the American Lamb industry including producers, feeders, seed stock producers, and processors. American Lamb came to Murmur Creative looking for a way to reinvent their brand, appeal to a wider audience, and more easily compete with the behemoths of the American Beef and pork industries, as well as the New Zealand lamb industry. The challenge presented, was to make lamb seem less like a meat for holidays or special occasions and more like an everyday american meat that can be had for any meal. We wanted to create a brand identity that taps into the heritage of American Lamb, while also presenting American Lamb as a current and vital industry. For the logo, we combined a classic americana aesthetic with contemporary style. We wanted the word “Lamb” to stand out, so we made it larger than the word “American” and used additional design elements (the stars and U.S. map) to reinforce the american aspect of the identity. The distressed lettering gave the mark the look of a stamp, which suits American Lamb well, as their logo often appears on lamb packaging and serves as an indicator of quality and locality. In preparation of building their new website, we hired a food stylist to work with our in-house photographer. We even bought an entire lamb to butcher, cook, and photograph. In order to shrug-off the holiday stereotypes attributed to lamb, we created table settings that were festive but casual. What resulted was a beautiful photoshoot of delicious lamb cuts and dishes that we used for the homepage and the cutting board page of the website. The website is quite large, with over 600 recipe pages and an eCommerce store. Our developers built the website using responsive design and a user-friendly WordPress backend. We also designed branding collateral such as business cards, infographics, Power Point presentations, social media styling, posters, and more. 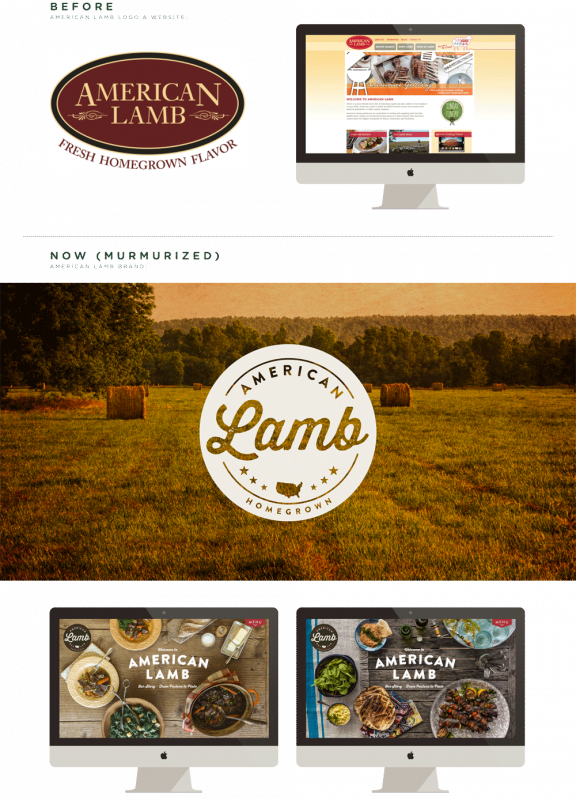 American Lamb’s new identity and website have garnered them much praise, increased engagement on their website, and increased traffic. American Lamb was so pleased with this project that they’ve already commissioned Murmur Creative to design two more websites as well as various branding projects.